Microsoft Windows SharePoint Services features are collections of logically related items and operations that can be added to and used repeatedly across site definitions. Advantage: Features reduce versioning and inconsistency issues that can arise among front-end Web servers. Feature activating or deactivating functionality in the course of a SharePoint deployment easier. 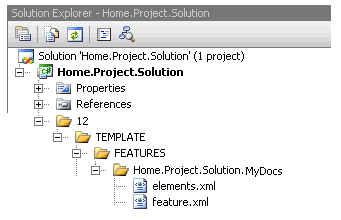 Here “Home.Project.Solution.MyDocs” is custom folder name which contains feature and elements xml file. Features can be scoped at the level of a site, site collection, Web application (virtual server), or server farm. A particular feature can be activated for a single scope. The scope of a feature is determined by the value of the Scope attribute of the Feature element. ■ Web Site scope Feature (Scope=”Web”): A Web Site scoped Feature is one that can be activated only at the individual Web site level . ■ Site Collection scope Feature (Scope=”Site”): A Site Collection scoped Feature is one that can be activated at the site collection level and contains items that apply to the site collection as a whole (for example, content types that are shared across the site collection), as well as items that can be activated per site (for example, list instances, etc). ■ Web Application scope Feature (Scope=”WebApplication”): A feature scoped for a Web application, or virtual server, can be activated or deactivated and can contain the elements for virtual server assemblies. A feature can be dependent on another feature activation. Activation dependencies can be expressed for features of the same scope, or a feature at a particular scope can be dependent on a feature at a different scope (a cross-scope activation dependency). For example:- Below feature can be activated if site has enabled publishing feature. Description="This activate if publishing feature enabled on site." to deploying the Custom PageLayouts, Site Content Types and Site Columns feature." Here I am going to give below article url where I have implemented custom feature. Visit these to understand how you can implement custom feature. Adding list event on specific list.